We hung our underwear out to dry over the streets of Aix-en-Provence (that’s where the drying rack was). Michael stuck his trumpet out our window to play for the tourists in Vannes (but as we were on the third floor, no one saw where it was coming from, which suited him just fine). 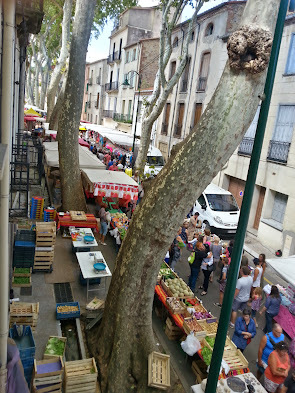 We peered down from our windows in Ceret every Saturday to see the market being set up (and of course ventured out into it). We learned to keep a closer eye on our bags in Barcelona (you read about that one). We hosted a dinner party in Asheville (in a lovely house bigger than any I ever hope to own). And just last weekend we watched my brother (finally) marry the wonderful woman he’s been dating for a very long time. My niece and my new sister-in-law. For those of you thinking that my days of solo travel are over, I beg to differ. Over the last four months, Michael and I have spent six weeks apart. To the aforementioned tallies, I can personally add ten different hostels, one hotel, one house, and one farm–and an additional two countries. Just two weeks after we arrived in France, I flew to Portugal to spend ten days on the Portuguese Camino to Santiago. I spent a couple days in Paris to meet a friend from NY whose travels happened to coincide with mine. I left Michael in Vannes and hopped a boat to a goat farm on an island for a week of volunteer work. Less than twenty-four hours after returning to the US, I drove up to New York for some family time. Four days in New York turned into ten. Because I was enjoying it. And because I can. I spent a few days with Michael before leaving him again for two weeks on my twice-yearly writing retreat. So what’s next? This month, Michael will be in Asheville and California. I’ll be in New York and Montreal. And we’ll meet again in a house that stands just thirty seconds away from the shores of Schroon Lake–whose waters will be frozen over by the time we leave there in December. Summing it all up like this, I’m a bit speechless–and I’m a writer, so that’s saying a lot. During these times–when I look in awe at the wonderful life I am blessed with–all I can think to do is give thanks. I’d like to thank you all, dear readers. You who have said, “Go!”. You who have read this blog–some for many years. Thank you for subscribing. For telling your friends about this blog, or about me, in hopes of inspiring someone else. Thank you to those who have posted a comment or contacted me personally. Thank you for asking me to speak to you, your friends, your students. Thank you to those of you who have made a change in your life and shared your fears and excitement with me. If you’re one of those people, stop right now and be damn proud of yourself. I’m sure proud of you. I don’t know if or how my life would be different if I didn’t start this blog. But I can tell you this: my life is so much better for having done so. And for that I thank my first writing class: our teacher, Glenda Beall, who gently coaxed our stories out of us, my classmates who listened to those stories and laughed or cried and told me to keep writing, the classmate who showed me what a blog was when I had no intention of ever starting one, the classmates who started the on-line writing group and eventually our twice-yearly retreats, and to all my successive writing teachers and classmates. And to all of you. I now know I like to write for an audience, and I thank you for showing up to my performance.